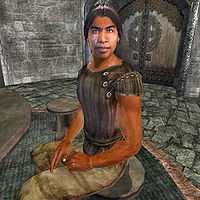 Winson is a Redguard commoner who lives and works at Luther Broad's Boarding House in the Imperial City's Elven Gardens District. Winson lives his life in obscurity and prefers to go unnoticed by his fellow townsfolk. As a result, he divides all of his time between working hard at Luther's and then spends all of his earnings at the Arena. He leaves the inn every morning at 7am and heads directly to the Arena and stays there for a whopping fourteen hours, betting and cheering, while downing cheap wine. When the Arena closes up at 9pm, he heads back to Luther's and works all through the night, without ever eating or sleeping. On the 30th of each month, Winson leaves Luther's at midnight and starts his long journey towards Bravil. He crosses the Talos Bridge before heading southeast on the Red Ring Road, passing the Ayleid ruins Fanacasecul and Vindasel on the way. Once he reaches Pell's Gate, he heads south on the Green Road until he finally reaches Bravil after nearly fourteen hours of traveling. Once there, he enters The Lonely Suitor Lodge for two days of socializing and drinking. At midnight on the 1st, he leaves Bravil and travels all the way back to the Imperial City. He wears a set of common lower-class attire, belted braies with a matching vest and a pair of braided leather sandals. His only other possession is a small amount of gold. A man of few words, he will only greet you briefly: "Winson. I just work for Luther. I don't want no trouble." And when asked about his city of choice, he will give you a piece of advice: "You got to be careful. You don't want people taking notice. Just keep quiet, keep your head down." If you run into him while he is betting at the Arena, he will casually reject you: "What? Look, pal, no talkie right now, okay? I'm here to watch people get mutilated, not blab like an old woman." Winson is supposed to take a break from the Arena on Tirdas and walk around the Arboretum from 9am to midday, and on Turdas, when he should head for the Temple district at 8am and also stay until midday. Unfortunately, his betting AI package has the "Must Complete" flag set, which means it stays active and he never leaves the Arena. The "Must Complete" flag mentioned above also stops him eating between 6 and 8pm. Winson is supposed to sleep between midnight and 6am, however the cell in which this should happen has no beds, causing the AI package to fail.